Over the past few days, I've been doing some serious inventory management. I've got some long bus and plane rides ahead of me and I need to make sure I take everything I need without getting bogged down. It's times like these, when I find myself begging the zippers on my backpack to close, that my mind drifts to the concept of "inventory Tetris." While I haven't done any scientific studies, I get the impression that limited inventory systems and item management aren't very popular game systems. This is understandable, as arranging and storing virtual items usually isn't as exhilarating as exploring fantastic landscapes or battling mythical beasts. As one poster on RPGnet Forums put it: "There is nothing epic about packing your goddamn bags." I think inventory management is an interesting example of the uncanny valley as applied to in-game actions. Having to meticulously pack your briefcase in Resident Evil 4 is definitely closer to real life than Link's bottomless pockets in the Zelda series. However, getting closer to the real world often just highlights the remaining differences. 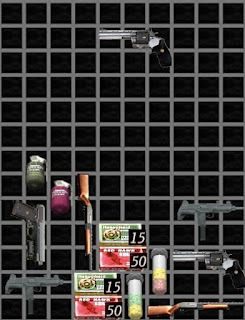 Consider again the RE 4 example: having to deal with limited item space just raises more questions: What kind of huge suitcase can hold a rifle and a rocket launcher? Why can't herbs be wrapped around canisters of health to save space? Why is everything arbitrarily locked to a grid? Packing in real life doesn't conform to a single set of rules: objects are flexible, clothes can be used as padding for breakables, and suitcases can be sat and squished down. In seeking to recreate the realistic pressure of having too much stuff and not enough space, RE 4 can feel inadvertently arbitrary. Even so, I don't mind a bit of inventory management. In fact, I enjoyed RE 4's system of item storage because it rewarded a careful packer. Rather than deal with arbitrary numerical limits on items, I could carry whatever I wanted as long as I could fit it in the briefcase. If I can suspend my disbelief when it comes to zombies, I think I can mange to go easy on suitcases. More broadly, limited inventories force me to fight my tendency to hang on to every minuscule object I encounter in games. By the time I reach the end of most RPGs, my item list is usually bulging with a ridiculous number of weak and useless items that I had been hoarding "just in case." As Matthew Gallant demonstrates, inventory Tetris taps into that familiar impulse towards compulsive organization. True, utilizing every square inch of space in your virtual luggage or managing your stock of digital goods seems decidedly less heroic than saving the world, but there remains a certain amount of satisfaction in finding a place for everything. Overcoming challenges with limited means can be very satisfying, as can organizing your gear in such a way that keeps the most useful tools at the ready. As an added bonus, you don't have to worry about airport security rummaging through your meticulously-packed stuff in a video game. Which reminds me: I should probably leave my fire arrows at home. I like to be organized in both my day-to-day life and in video games. I'll invest a good deal of time into grouping items in my inventory by category/type and I methodically try to get rid of items I no longer need. I also tend to dislike inventories that don't give me a lot of freedom to organize my items. I'm curious, does anyone out there who considers themselves to be disorganized in their everyday life keep a sloppy inventory when playing games? I actually love a game with an interesting inventory system. Actually, RE4's inventory system was one of my favorite things about it, and I was floored when I first read that there were people who found it annoying. It must be a matter of the kind of game experience you're going for and how that expectation affects the idiosyncratic lens you're viewing the game through. I suppose the people who found it annoying must have felt like it broke the "flow" of the game in some way. 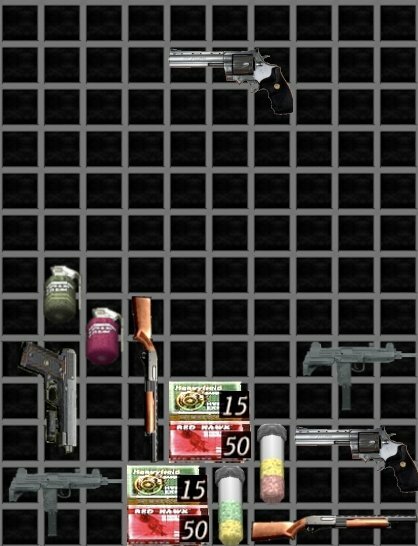 If RE4 is primarily a game about constantly moving and shooting zombies, then inventory tetris probably would feel like an annoying speed bump to the action. But I find inventory systems (i.e. good ones) incredibly fun. Some games--like RE4, Fallout 3, or Dead Space--have inventory systems that make me feel like I'm in living a stereotypical "strap-em-on" montage from an action film. I love the sound of the clicks and snaps as I reload, reorganize, prioritize, make plans and contingency plans for each useable item. I would love to see a game that was extremely inventory intensive. A game that required me to be play with a rich inventory system like I was some kind of super MacGuyver, plundering dungeons with my nearly bottomless bag of holding. No combat skills or survivability skills outside of what I can find, make, and invent. We're talking Odin Sphere on crack! I for sure would play that. I just want to say you people are all crazy. Love for inventory systems? I'm shocked. My ideal inventory systems makes me forget there is one at all. The last thing I want is a game "that was extremely inventory intensive." I'm just saying - madness people, madness. Good to see that I'm not the only inventory enthusiast out there. Wish me luck, as tomorrow I apply my 3D Tetris skills to the task of loading a moving van!